Sand Art is a fun activity to do, and it’s so easy and effective! 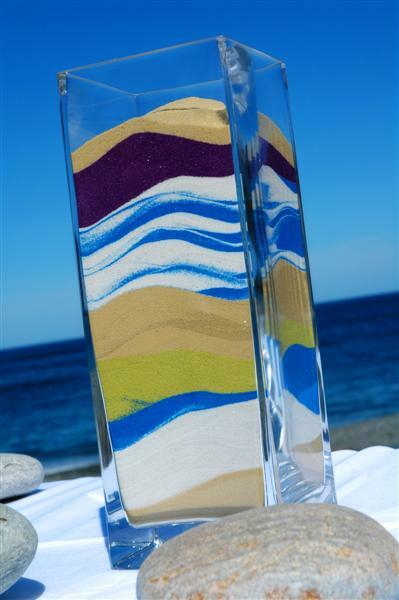 With Sand Art you can make a statement in your home and show how much you like the beach! When thinking of the beach, of course you have to think of sand! To me the beach and sand belong together. And as annoying as sand can be when you try to clean it out of your clothes and bags after a day at the beach, the beach would just not be the same without it! I find it absolutely amazing how beautiful a bit of colored sand art in a glass container can look. You just have to layer it in different patterns. 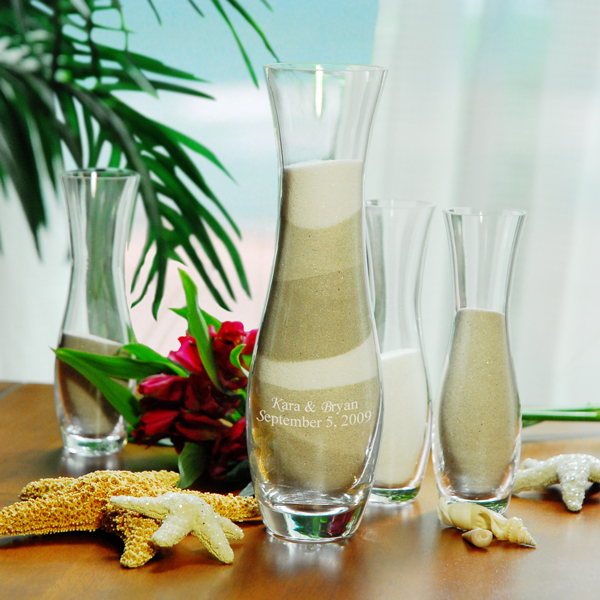 Table decor like the one below is very popular at beach themed weddings. I can tell you now though that i don’t need to get married to display something like this in my home! There is really not much to creating a beautiful piece of art like these yourself. Simply pick the colors of sand that you want to work with, have glass jar or vase handy that you like, and get creative! The only thing you have to be careful with is to try and not mix the colors up when you pour the sand. That’s it! 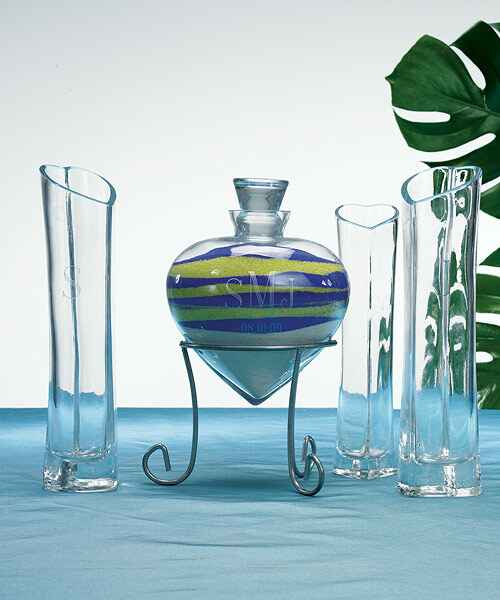 This rectangular vase looks very bold and stunning! Having a thick glass adds a great modern touch to it, too. Create a fresh and colorful statement piece with Sand Art and Plants! A great way to display your gorgeous piece of sand art is also if you add some plant to it. Have a look at the pictures below. I would suggest to pick artificial succulents, as they will not need any water. They also look kind of beachy, so you will have a complete beach sand art look! Don’t you love these? Depending on what kind of vase or display container you use, and depending on the color of your sand, the result can be either funky, or very stylish and elegant! It is really up to you what you end up with. 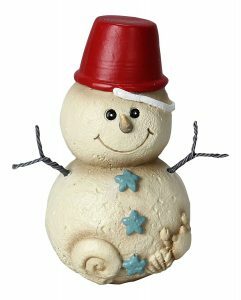 But I think working with sand to decorate your home is a lot of fun and not difficult at all. Of course, to stay with the beach kind of theme, you should probably pick mainly colors that will reflect that ambience. Different blues, beige, sandy colors, greys and browns, yellow/green, just to get you started! Make your next creative project one with sand art! Petra is German and absolutely loves the beach and the ocean. She is living in sunny Perth, Western Australia, with her partner, 2 children and 2 Jack Russell dogs and takes every opportunity to go for long walks at the beach, or go beach combing, or just watch the sunset at the beach with friends and a glass of wine. 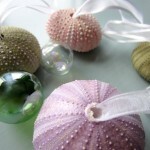 With this blog she wants to help you bring the precious beach into your home to relax and enjoy! I think it looks wonderful, too! I actually used to do this in my teenage years with friends, in all sorts of colors, but I love the beachy colors the best. I am glad it worked for you too! 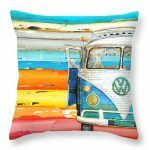 « Colorful Beach Decor Makes Your Home Come To Life!